During the 1930’s land in the Hangklip area between the Palmiet River and the Rooiels River was acquired by three business partners, namely Harold Porter, Arthur Youldon and Jack Clarence. They called it the Hangklip Beach Estates and divided the area into three townships, namely Betty’s Bay (named after Youldon’s daughter, Betty), Pringle Bay and Rooiels and sold off plots to interested parties. In 1962 the Hangklip Beach Estates added to the Garden property by giving it the adjoining area of Disa Kloof. Later still, the then Betty’s Bay Village Management Board, donated an additional adjoining piece of land which reaches to the sea. In total the land incorporated into the Harold Porter National Botanical Garden now comprises 200.5 ha, stretching from the top of the Kogelberg mountain range to the sea, encompassing a whole river system. 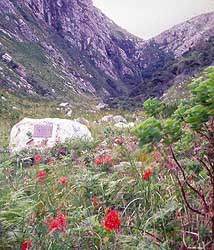 Ten hectares have been cultivated as a garden while the remainder is managed as a natural reserve which is included in the core zone of the Kogelberg Biosphere Reserve, while the developed area forms part of its buffer zone. For a time his wife Olive May, and son Arthur, continued to support the Garden and were instrumental in shaping some of the features which can still be seen in the Garden. One of these is the entrance building, designed by Arthur, and built from the stones of their home, Afterglow, which was burned down in a terrible fire in 1960. The pole at one corner of this building was fetched with considerable effort from the beach where it had washed up after a massive storm. This building was opened on the 23rd Sept 1963. A bridge connecting the main Garden to Disa Kloof across the Dawidskraal River is named after Olive May Porter and was opened by her on 14 February 1967. Another feature in the Garden which owes its existence to Olive May is the Dunes section of the Ecosystems Walk. She died in 1984 at the grand old age of 98 and her ashes were scattered near her husband’s memorial stone. Harold Nixon Porter assisted by the following foremen in turn – Mr Veldsman, Mr Ryk Grunewald and then Mr Harry F Wood, (1957 – 1959) who stayed until the first NBG curator was appointed in 1960. No curator for 8 months. Garden run by the foreman Mr Leslie Harper, and 6 labourers and checked fortnightly by the Kirstenbosch curator. 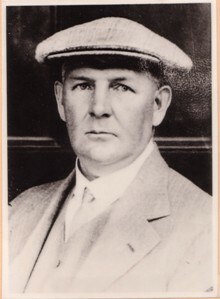 Mr Johannes P (Hans) Heilgendorff. A full-time horticulturist was appointed to assist the curator in August 1991. Before this time the curator had to fulfil the managerial, horticultural, administrative and educational roles singlehandedly. Mr Rudi M Britz. A typist, Mrs Marie Britz, was employed 1 day per week during the latter part of this period. Ms Catharina (Karin) M Behr. Staff complement at this stage was 11. As from 1 June 1995 a 5/8 post was approved for a typist/admin assistant. In March 1996 this post was upgraded to a full time post in order to assist the curator with administrative duties. A second horticulturist post was also approved. Additional Groundsman I and II posts were approved and the staff complement increased to 18.